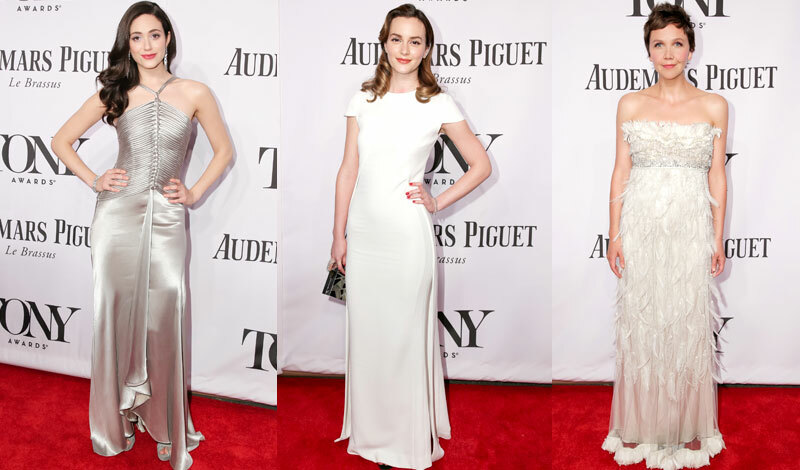 As expected, last night’s Tony Awards were stuffed with drama, surprise, and gowns galore. Host Hugh Jackman used his emcee duties to rap with T.I. and LL Cool J, as well as celebrate the rest of the noms and winners at the 68th annual award ceremony. A slew of Hollywood-adored types who’ve found success on the Great White Way, like Daniel Radcliffe and Neil Patrick Harris, were on hand for the big event, alongside a few A-list types out for a night on the town. Emmy Rossum stepped out in a silk Ralph Lauren number, Maggie Gyllenhaal went with a feather-festooned cream Dolce & Gabbana frock, and Leighton Meester stunned in a pearly white Antonio Berardi gown, accessorized with her new husband Adam Brody. Meanwhile, Lena Hall, who took home a Tony for best actress in a musical, definitely won in the red carpet category as well, thank to her black Zac Posen gown. Bravo!